Luke Brewster (pictured with cardiovascular biologist Mary Wagner) received a seed grant to improve blood flow in patients with limb ischemia (blockage of blood vessels) by rejuvenating mesenchymal stem cells cultured from bone marrow. The Emory/Georgia Tech Regenerative Engineering and Medicine Center recently awarded 11 seed grants, totaling $630,000, for promising new research in regenerative medicine. The seed grants focus on how the body—including bone, muscle, nerves, blood vessels and tissues—can harness its own potential to heal or regenerate following trauma or disease. “We looked for projects along the innovation spectrum, including early-stage projects for which the potential payoffs justified taking the risk and projects supported by preliminary data that were at an advanced preclinical or early clinical stage,” said Regenerative Engineering and Medicine Center Co-Director Robert Guldberg, a mechanical engineering professor at Georgia Tech. Guldberg is also executive director of the Parker H. Petit Institute for Bioengineering and Bioscience at Georgia Tech. Twenty-eight seed grant proposals from across the Georgia Tech and Emory campuses were submitted and those with the strongest potential for impacting the field of regenerative medicine were selected. The grants were jointly funded by Emory and Georgia Tech, with Emory's funding coming via the NIH-supported Clinical and Translational Science Institute (ACTSI). “We are very excited that the funded proposals will initiate new partnerships among regenerative medicine researchers at institutions across Atlanta,” said Regenerative Engineering and Medicine Center Co-Director W. Robert Taylor, the Marcus Chair in Vascular Medicine and Director of the Division of Cardiology at the Emory University School of Medicine. Taylor is also a professor in the Wallace H. Coulter Department of Biomedical Engineering at Georgia Tech and Emory University. 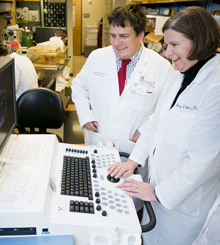 The collaborative regenerative medicine initiative at Georgia Tech and Emory University began in 1998 with the establishment of the Georgia Tech/Emory Center for the Engineering of Living Tissues (GTEC), a National Science Foundation Engineering Research Center. Since then, more than 15 technologies have been licensed, 13 startup companies have been formed and three clinical trials are under way. Today, more than 40 researchers from Georgia Tech and Emory University are working together as members of the Regenerative Engineering and Medicine Center, which launched in 2011, to develop integrated technologies and therapies that harness the body’s own cells and repair mechanisms to heal itself. An interdisciplinary team of stem cell biologists, stem cell engineers and a surgeon from Georgia Tech, Emory University and Morehouse College received one of the $50,000 seed grants. The team plans to improve the quality of stem cells derived from the bone marrow of individuals with critical limb ischemia so that they can be used as a cellular therapy to prevent amputation in this patient population. Critical limb ischemia—a severe blockage in the arteries of the lower extremities that reduces blood flow—affects more than 500,000 people annually and can cause pain, tissue loss and lead to amputation. “Mesenchymal stem cells derived from the bone marrow of healthy individuals have been shown to support new blood vessel growth and help re-establish blood flow to an affected area, but the quality of mesenchymal stem cells in individuals with critical limb ischemia is known to be poor because of the typical patient’s age and medical condition,” said Luke Brewster, an assistant professor in the Department of Surgery at Emory University. To overcome this challenge, the research team plans to develop techniques for rejuvenating mesenchymal stem cells cultured from amputated ischemic patient limbs in a novel manner that will enhance cell expansion and reduce the inflammatory response. In addition to Brewster, the research team also includes Todd McDevitt, an associate professor in the Wallace H. Coulter Department of Biomedical Engineering at Georgia Tech and Emory University; Ian Copland, an assistant professor in the Department of Hematology and Medical Oncology at Emory University; and Alex Peister, an assistant professor in the Department of Biology at Morehouse College. Julie Champion, an assistant professor in the School of Chemical and Biomolecular Engineering at Georgia Tech, received a $50,000 seed grant to create an innovative biomaterial capable of suppressing immune activity in the body. The material, which is made from engineered regulatory T-cell proteins, will operate through direct contact with immune cells. The success of many regenerative medicine therapies is limited because the introduction of foreign biomaterials, cells or tissues into the body causes an inflammatory response. According to Champion, the new material she is developing could be incorporated into regenerative biomaterials directly, combined with cell or tissue therapies, or used as pre-treatments prior to regenerative therapy to suppress immune activity. “This project demonstrates a new biomaterials platform that will interact directly with the immune system in both a physical and biological manner and could lead to innovative immune therapies for injured or sick patients that require regenerative medicine to heal and restore function,” said Champion. A committee of investigators from Georgia Tech, Emory University, Children’s Healthcare of Atlanta and the University of Georgia awarded the grants that spanned basic science and translational research to researchers from a broad range of disciplines including engineering, medicine and biology. the quality and expertise of the research and investigator(s). “The seed grants also allow the unique blend of engineers, scientists and clinicians at Georgia Tech and Emory University who have a successful history of collaboration in regenerative engineering and medicine to help train the next generation of leaders in this rapidly growing, interdisciplinary field,” said Guldberg.